When Christmas appears in shops, and carols begin to play on the radio, giddy excitement rises within me. I love Christmastime. The light displays, the concerts, the gifts (yes, the gifts, totally my number one love language), delicious food, gatherings, hugging the people you love dearly but never see enough. You name it, I love it. And then I begin the frenzy. I jam-pack our schedule until you feel like you can't breath because you have eaten too many hors d'oeuvres. I want all the activities, events, places, and things. I squeeze each hour to its fullest, inevitably exhausting myself and those around me. When slowing down, in an effort to do less, it feels like missing out. When attempting to hibernate for a weekend, I get hives. My tendency is to want to go, go, go. And on top of the constant activity, I am overwhelmed by the desire for things to be just so, perfectly times and positioned. I've once heard it called, "forced family fun." There are plenty of other unflattering labels, but ultimately it stems from a fear of falling short. I've shared about advent calendars before. This year we are adding in Mom Diggity Design's advent calendar (#mddadvent on instagram) and I am reading both She Reads Truth Advent Study and We Will Wait by Heather Boersma. These resources are wonderful contributions to preparing my heart for Christmas, but they can also be a downfall when the schedule or activity begins to rule too greatly. The "I must make it perfect" mentality begins to rear its ugly head. The thought to scream, "Stop interrupting me, I am reading my bible," begins to bubble up inside me. (Don't get me wrong, I highly recommend these resources as well as the ones I included in my previous advent post.) The problem isn't with the things I am doing or the what I use, the problem is in my heart. Reaching too far out, stretching too thin instead of focusing that all we really need is Jesus. He is the perfect gift. I will never fall short, because he has bridged the gap. He is the perfect gift. Abiding in Him is never missing out. It means opening an advent activity card that says, "make Christmas cookies" and telling the boys, we have no flour in the house, but if we were to make cookies, what flavors would they be? And colors? What shapes, if we had any cookie cutter in the world? Instead of frantically fighting rush hour and rain to get to the store to force an activity, we played pretend and my kids had just as much fun! Hopefully there was also some life lessons in there about not being perfect. Or when the boxes of Christmas ornaments sat out for days, taking up the last of the available space in our teeny tiny apartment, I waited patiently for the night we would decorate the tree and we did so one ornament at a time instead of the hurried rush that would have been the day we initially "scheduled" the decorating to be done. Not hanging the 27 feet of pre-lit garland you just bought last year. Because some years you don't need it all. Slowing down enough to answer questions like, "Why do we put lights up for Christmas?" and "Can we give candy canes to everyone in the city and tell them its a J for Jesus?" I have a feeling I am still bustling about too much and missing gems, but taking hold of the ones I catch and having good chats. It means reading a few days worth of She Reads Truth at once because you are falling behind on the study, but in honesty have given yourself through January to finish reflecting on the birth of our Savior. Because why rush that? Its switching around the days in the advent calendar (that you also wrote in your calendar so you wouldn't miss them!) because the weather looks nice and it is a good day to go see lights instead of whatever was supposed to happen. It means letting all the ornaments live on the same branch. We've begun singing O Holy Night without the music in the background. It would most definitely hurt your ears. But there is something about singing "fall on your knees, O hear the angels singing" that keeps Christ in the center of our hearts and conversations. I am not standing on a mountain proclaiming my successes, I am falling on my knees, awed by the miracle in a manger. Perhaps these aren't your particular struggles. Maybe letting these seemingly small things go would still amount to greater stress in your life. Or maybe holding things loosely looks different for you. Hear me when I say that these are all still a learning process for me. Whatever your struggle may be, remember it is a journey of growth, not a race towards perfection. And lest you think our decorating one ornament at a time was happy jolly family fun, imagine this scene: Hudson pulling ornaments off the branches, separating the top foil from the ball and then stomping the foil under his feet, flattening it like a pancake. An activity that brought him great joy, laughter from his brother and increasing heartburn for me. In fact, while writing this post, I had to take one of those foil tops and ornament hangers out of his mouth. The ornaments are high! Our of his reach! He just pushes a chair up to the tree to grab them. Heartburn. There is always a bit of "forced family fun" during the holidays, but even that leads to learning, right? 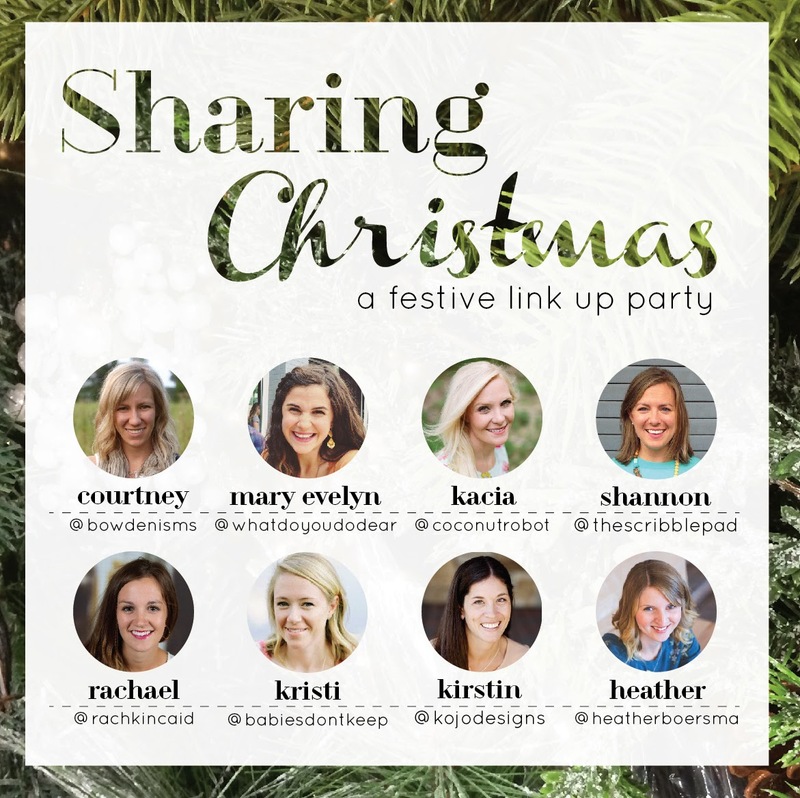 And now, will you join us in Sharing Christmas? I am honored to host with this group of fabulous ladies. Check them out and share your own post below! And December is usually nuts for us too. My solution? Move across the ocean where you don't know anyone and don't have any commitments and there aren't really that many "Christmas-y" things to do in your town so you don't even have the option pack your schedule. HAHA. J for Jesus. Honestly.....that's adorable. Love how you're slowing down this year and just doing your best to love those boys. It's not perfect, but it is awesome.